Shavuot 5778 learning in English and Hebrew at Hartman Institute in Jerusalem, May 19-20, 2018. Full program here. 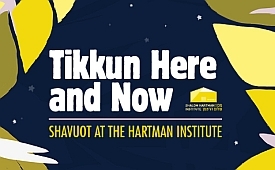 Watch Yossi Klein Halevi in a new Shavuot-related webinar recorded in May 2018. Donniel Hartman says Jewish tradition speaks through the language and imagery of revelation, while modernity rarely gives itself to the claim of revelation. These are the issues modern Jews must wrestle with, Donniel Hartman says. In that spirit, we offer this special content section, in which Hartman Institute scholars explore questions of pluralism, revelation, modernity, and more. Marcie Lenk: Shavuot. Pentecost. Harvest. First Fruits. Revelation at Sinai. Holy Spirit. Torah.